Bagong break? Our no-fail schedule to get you through the toughest fake holiday. Wake up when the alarm goes off, but stay under the sheets for a good 30 minutes before you bring yourself to actually get out of bed. Take a long bath and an equally long breakfast. Grab your iPod, and make a post-breakup playlist with Christina Aguilera, Katy Perry, and Taylor Swift. Trust us, they are your spirit animals FOR LIFE. Drive to work WITHOUT playing anything from John Mayer or Boys II Men—especially Boys II Men. Instead, listen to Taylor Swift's "We Are Never Ever Getting Back Together," and sing along. Nevermind if your car windows don't have tint, and strangers can see you super emote. Eh bakit ba? Ignore classmates or co-workers carrying ridiculously large bouquets and heart-shaped chocolates. 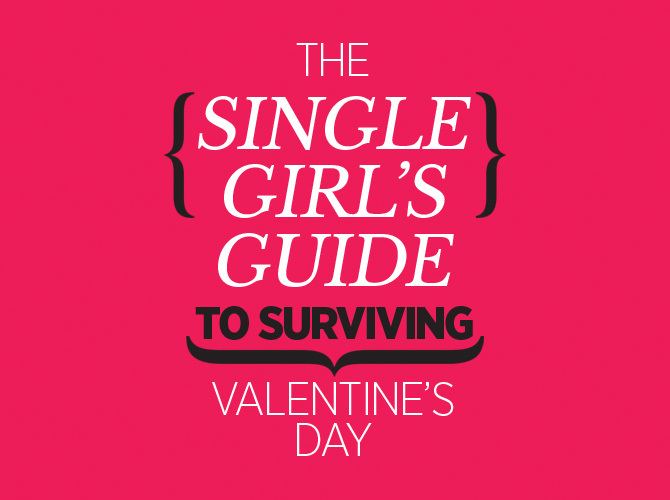 If they give you a pity stare about not having a date, tell them you already made plans with your co-single friends (you don't). Have lunch, preferably without annoying co-workers and classmates who have boyfriends/husbands. They will only narrate how they made dinner plans at Spiral, Circles, or Heat. Call up your best (read: single) girlfriend and talk to her instead. FaceTime her over lunch, and discuss how much you HATE boys. Nevermind if you had Starbucks in the morning, go get your second cup of expensive coffee. Eat two Krispy Kreme donuts or large fries from your favorite fast food chain. Today you will forget about counting calories. Regret dumping all that junk food in your system. Grab your running shoes and run around your village—or head to the gym, take a Plana Forma class, try Aerial Silk yoga. Skip! Jump! Be high on endorphins! YAY! Have dinner with your bestfriend and discuss for the millionth time why it didn't work out with your ex. Have a glass of wine. Heck, have three glasses of wine. Drive home. Pop in your favorite John Lloyd and Sarah Geronimo/Bea Alonzo movie in your DVD player and cry if you need to. If you're still feeling sad, alone, and depressed, isipin mo na lang, may sweldo na bukas. SHOPPING!